The integrated resort development basement excavation is nearing completion with more than 300,000m3 of material already removed. Probuild Project Manager Mark Jones said that was the equivalent to 120 Olympic swimming pools of material. “A further 100,000m3, or 40 Olympic swimming pools, is still to come out, but this will all be done by August this year,” he said. Over the coming months, road users will see a change in heavy vehicle movements around the site with the gate at William and Margaret St now closed. In time it may be used again, but for now the ramp accessing the gate is being removed and a new ramp is being created on the opposite side which will lead to the Elizabeth St end of William St.
“From early April this new ramp will be used as the main access point into and out of site,” Mr Jones said. Early in March a controlled blast was undertaken to break up the rock beneath the lift core for what will be Tower 1 of the integrated resort development. 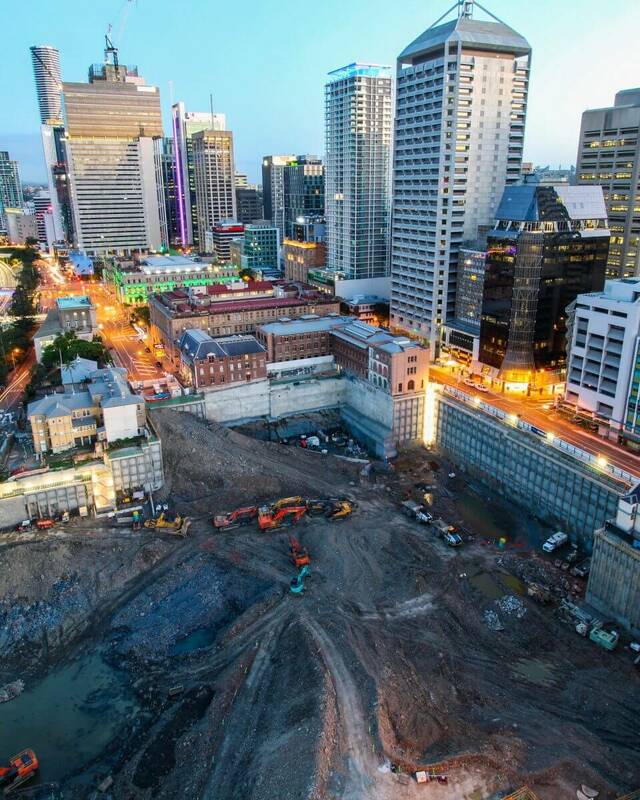 When Queen’s Wharf Brisbane opens, Tower 1 will house the luxury Rosewood Hotel and Dorsett Hotel, various restaurants and retail offerings and use a total of 14 lift cars to transport people up and down the 182-metre tower.